This approach is like buying all your groceries fit for following a Whole30 diet, and then buying a family sized package of Double Stuf Oreos to enjoy after a long day at work. In other words, the treats negate all the effort of a healthy diet. One way to avoid this is by diligently checking the ingredient list on your dog’s treats and selecting ones that list whole foods. Robichaud often discusses dog nutrition with her clients. She recommends avoiding corn, gluten, soy and wheat, and suggests finding kibble and treats that list a whole protein as the first ingredient. Another approach would be to take to your kitchen and hone your baking skills. Some ingredients you can source right from your own grocery list—kale, sweet potatoes, eggs and cheese to name a few. Other ingredients, you might have to buy special—gluten-free flour, for example. And of course, there are some ingredients you want to avoid, like artificial sweetener, onions, garlic, avocado, chocolate and coffee. If you are not interested in inventing your own treat combinations, there are many resources online and numerous cookbooks. 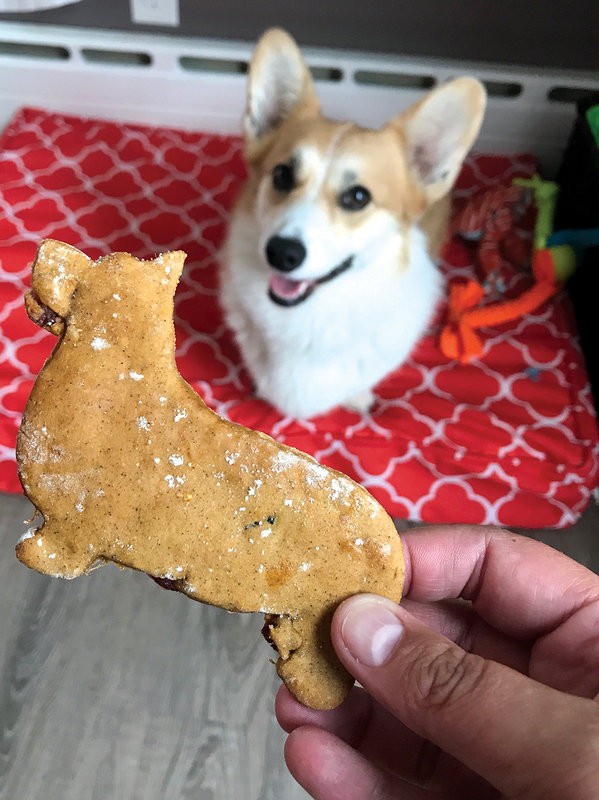 The Cran Yammy recipe on the next page is inspired by The Honest Kitchen, which is a company that produces dehydrated raw food for dogs and cats and offers a free online recipe book. Remove the peel from your baked and cooled sweet potatoes and mash. Whisk in eggs. Add honey. The more you whisk the wet ingredients, the smoother your dough will be. 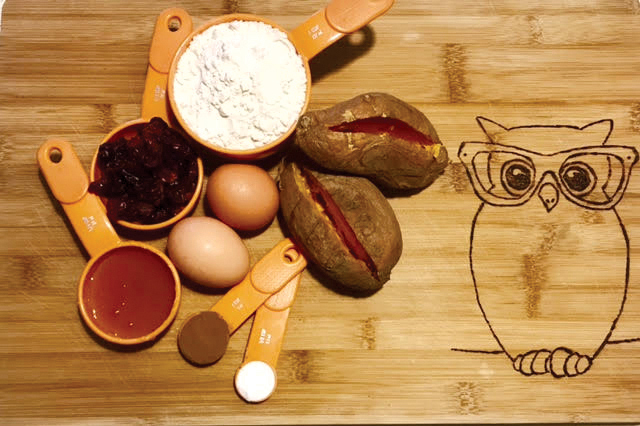 Once the wet ingredients are well combined, add gluten-free flour, cinnamon, baking soda and cranberries. Mix until thick dough forms. Chill dough for at least one hour. Once dough is chilled, sprinkle gluten-free flour on surface, dough and rolling pin. Roll to desired thickness and cut biscuits with cookie cutters or freehand with a pizza wheel. Place biscuits on a parchment covered cookie sheet and bake 12 to 15 minutes. Cool thoroughly before serving or storing. • Baking your own biscuits for the lower range of time will result in a chewy treat. Longer cook time will create a crispier biscuit, but must be watched carefully to avoid burning. • Leave biscuits on a cooling rack overnight before storing in an airtight container. Put storage container in refrigerator to extend the shelf life of your homemade treats. • This dough is sticky, don’t underestimate the flour you need to use when rolling out the dough or you’ll have a mess on your hands (and rolling pin, kitchen counter, etc). 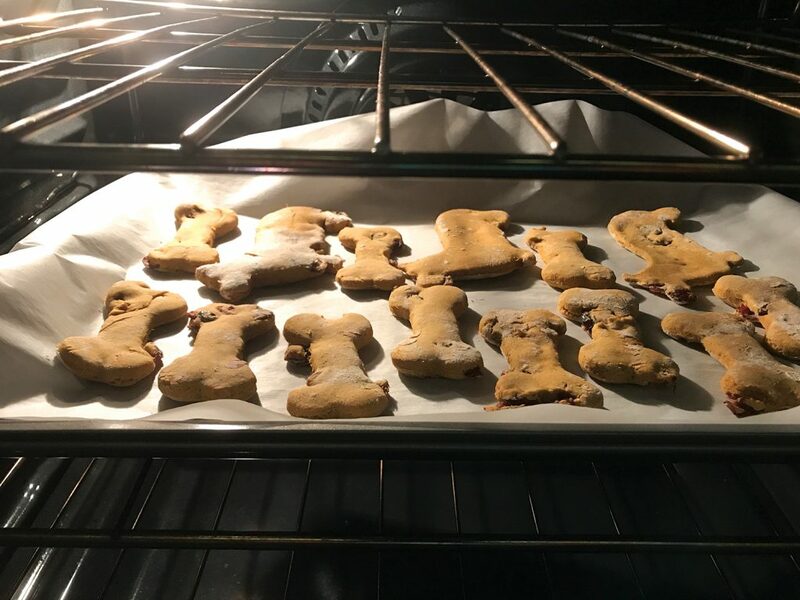 • Pick wholesome ingredients when creating your own dog treats, including those that are organic, gluten or grain-free, and safe for pup consumption. different food combinations you know your dog will love. Just remember, you need the right combination of wet and dry ingredients. • Making your own dog treats too complicated? 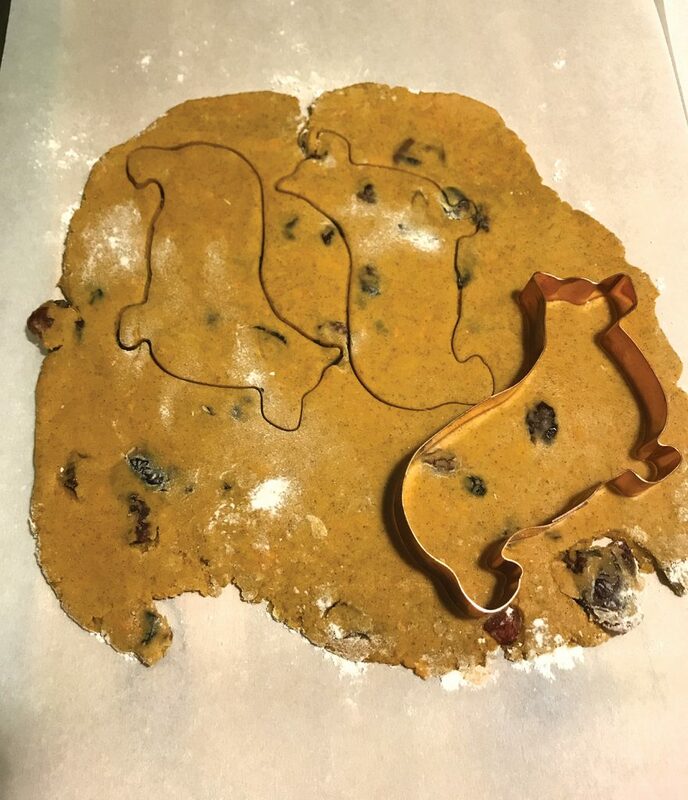 Find local bakers, such as the Growlin’ Gourmet based in Biddeford. Knowing who makes your dog’s treats is the next best thing to knowing what goes into your dog’s treats.